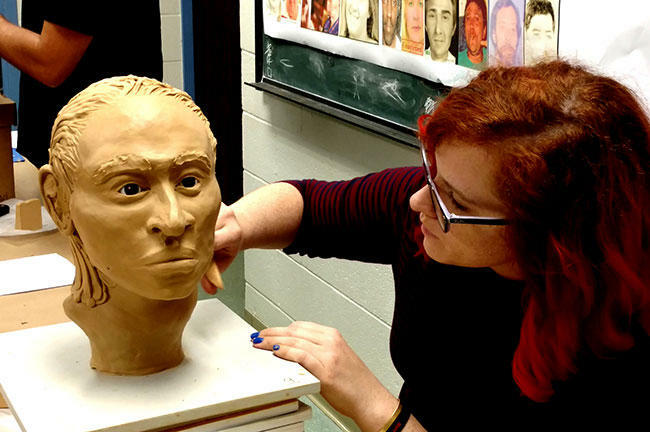 During the 'Art of Forensics' workshop at USF, freelance forensic artist Maggie Florence works on the likeness of a Hispanic man, believed to be 18-25, whose body was found in a grocery store in Frostproof in January 1993. 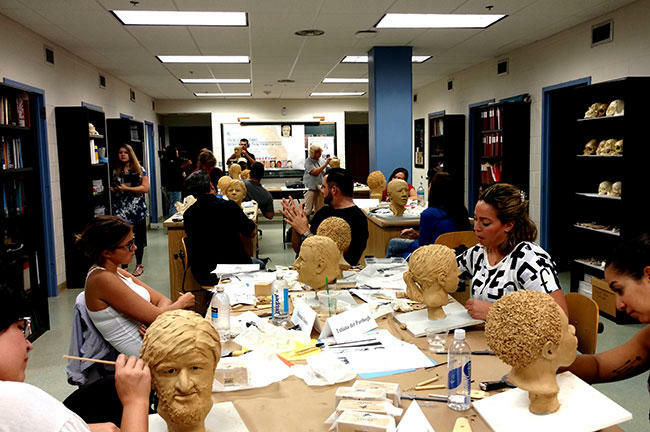 14 forensic artists from around the world visited USF's Tampa campus to take part in the workshop. 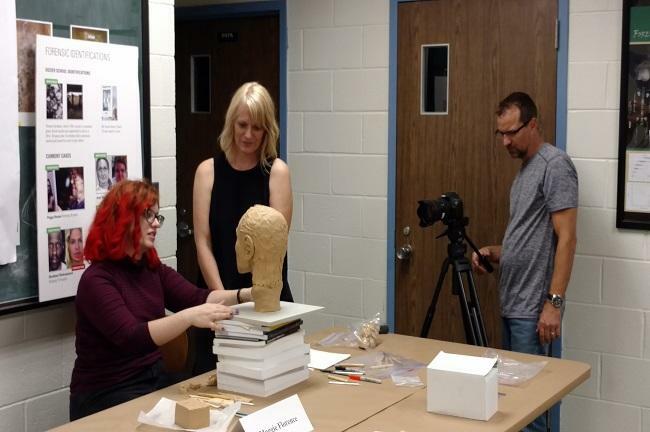 University Beat TV's Jesse McLane (right) shoots video of Florence & WUSF forensic anthropologist Erin Kimmerle. 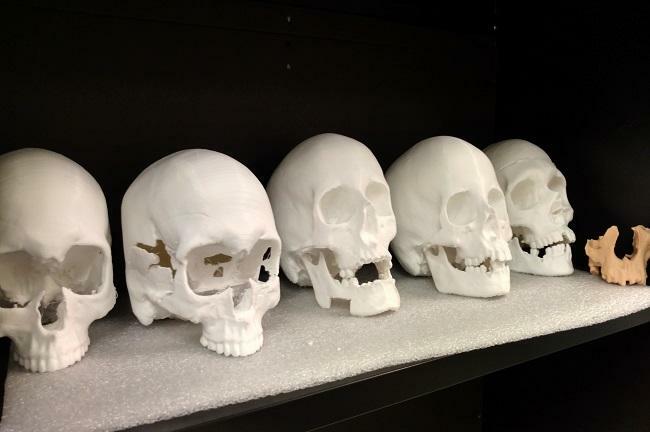 These 3-D printings of skulls are used as the basis for the clay re-creations. While Joe Mullins from NCMEC works on his construction (front), his wife, Emily Mullins, works on one as well. The skull of a 13 to 14 year old boy whose body was found in a pond near Daytona Beach in May 1972and Joe Mullins' reconstruction. The 14 artists presented their work to law enforcement at an event at the end of the week at the Tampa Bay History Center. 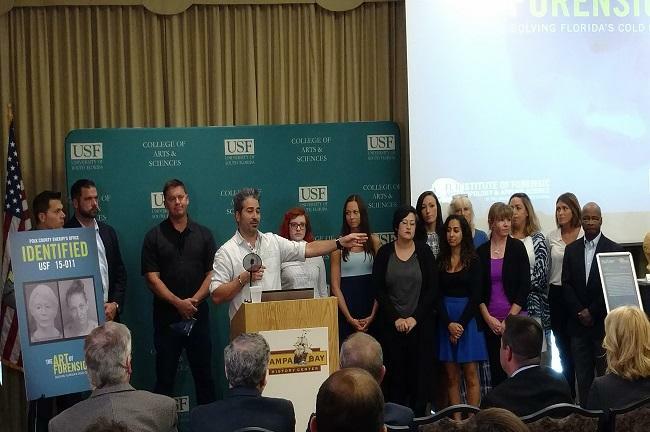 University Beat report on the USF "Art of Forensics" workshop. 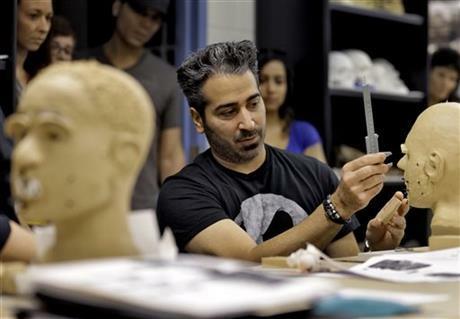 Forensic artists at a recent workshop hosted by the University of South Florida wrapped up their week of work by presenting their creations - fourteen clay busts of unidentified victims in cold cases - to local law enforcement. But in the middle of their presentation, a woman looking at one of the works at the rear of a downtown Tampa conference room broke down sobbing, sure that the face staring back at her was that of her sister, some thirty-eight years after she went missing. 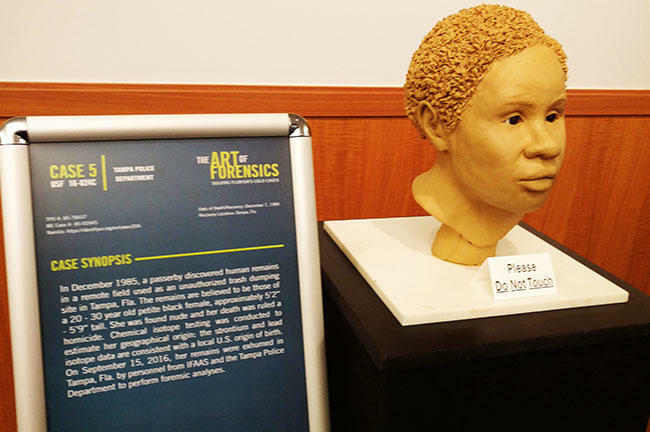 For the second year, the Florida Institute of Forensic Anthropology and Applied Science at USF welcomed fourteen forensic artists from around the world for a week long workshop called "The Art of Forensics." 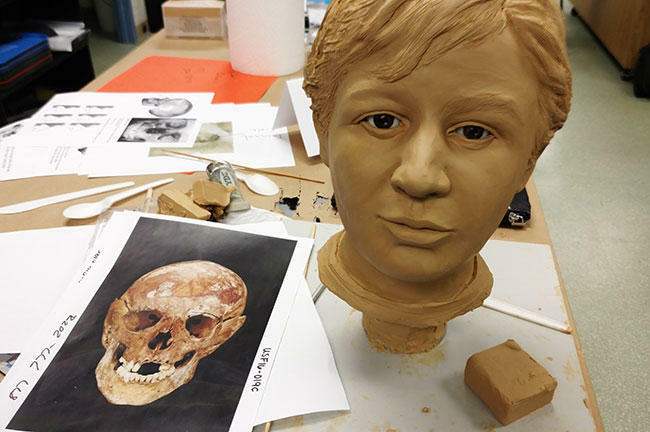 The goal, according to USF anthropologist Erin Kimmerle, is to bring art and science together to create three-dimensional models that would hopefully help identify the victims. “Faces are ultimately based on the anatomy, we don’t take a lot of creative license, but you have to have those artistic abilities and skills to work with clay, to work in Photoshop and drawing in order to put a face on that anatomy, and so it’s a great mix," Kimmerle said. 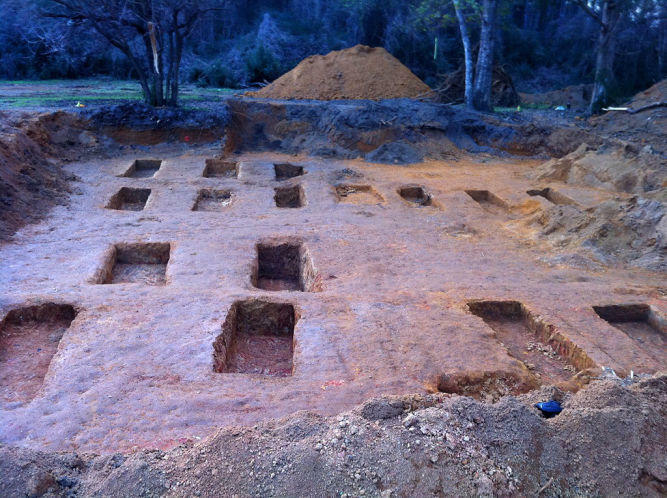 Kimmerle is known for her ongoing investigation of the Dozier School for Boys and the attempts to identify the young men whose remains were found in an unmarked graveyard at the Panhandle reform school. But for the Art of Forensics workshop, she and her team looked through hundreds of cases in their lab files and picked out twenty from around Florida and four other states, dating from September 1970 through March of this year. 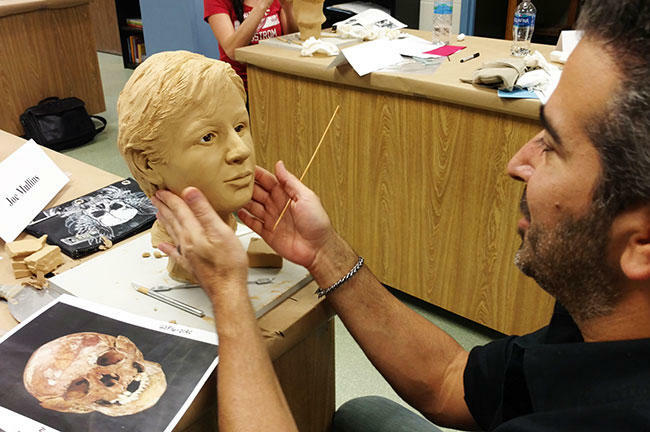 NCMEC forensic artist and workshop director Joe Mullins works on the clay reconstruction of the face of a 13 to 14 year old boy whose body was found in a pond near Daytona Beach in May 1972. The artists, under the guidance of Joe Mullins from the National Center for Missing and Exploited Children (NCMEC), then had just over 72 hours to create the clay busts. “This could be the last ditch effort for these people to get their names back," he said. The process started with remains of the skull of each victim. Scans were made and then three dimensional replicas were created, giving the artists the base for their clay re-creations. Otherwise, the artists had a very limited amount of additional data to work with. “The basic information you get from the forensic anthropologist is age range, male or female, ancestry, and those that have hair or clothing that were found with the remains, that’s really it," Mullins said. Building the face involves looking at the skull to figure out the features, like the basic height of the ear. “There’s other calculations for the angle of the ear, whether they have attached or detached earlobes, there’s information on the skull for the projection of the nose, the width of the nose, the placement of your nostrils, even the placement of your eyelids, all that information is there, it’s like the foundation to build the face on," Mullins said. The final busts are then photographed (see the images here) so local law enforcement and media can get the representations out to the public, with the hope they might jog someone's memory. In addition, the busts are scanned so further 3-D printings can be made if necessary. 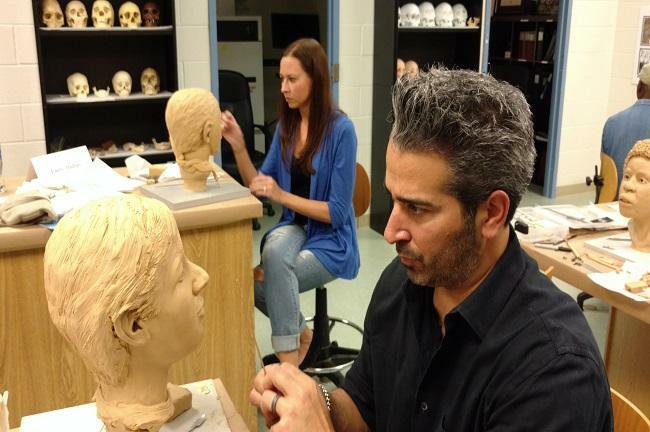 Kimmerle and the USF College of Arts and Sciences have hosted annual NCMEC workshops for almost a decade, helping around 250 forensic artists from around the world improve their skills crafting facial reconstructions, ranging from pencil and paper to computer-generated images to 3-D printed models. Maggie Florence attended the first 3-D workshop last year. The 28-year-old is a rarity in the forensic art world. While most of the artists at the workshop are tied to a specific agency, the Washington DC-area artist is a freelancer who does this in her spare time. I asked her, when she’s working on a re-creation, at what point does she finally stop and think she’s done. 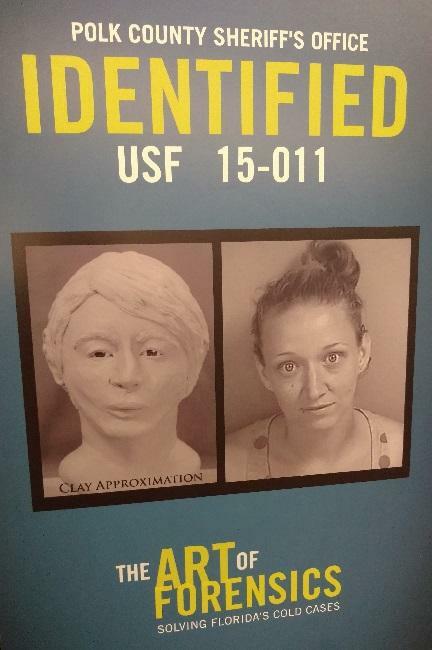 A sign shows the clay approximation created in 2015 by Maggie Florence next to a picture of Jessica Rousseau, who was identified through DNA testing. In 2015, Florence worked on the case of a 30 to 45-year-old woman whose remains were found in a field in Davenport earlier that year. In addition to Florence's reconstruction, law enforcement used other tools at their disposal. A DNA sample taken from the remains was entered into a national database and helped identify the woman as Jessica Rousseau, 33, from central Florida. However, standing next to a side-by-side photo of Rousseau and Florence's reconstruction, Wallace said the model was a useful device. “The pictures, you can tell, they look somewhat similar, but it was interesting when we found her sister, this here looks almost exactly like (Rousseau's) sister,” the detective said, pointing at the reconstruction. Florence said the identification brought about a range of emotions: first, joy that Rousseau had been identified and then sadness when she heard that it had been years since Rousseau, who lived a troubled life with a history of drug and physical abuse, had spoken to her family. “I had to go through my own kind of grieving process a little bit for her that I didn’t go through originally. Hearing the details about her family and seeing her photograph was very emotional for me,” Florence said. Is this the face of a Tampa woman who went missing in 1978? A woman who attended the Art of Forensics presentation believes that it is indeed here missing sister. Tampa Police hope DNA tests will confirm her identity. That kind of emotion was evident when the group's presentation at the Tampa Bay History Center was interrupted by the woman mentioned at the beginning of this story. Tampa Police detective Scott Bullard had invited the woman, who he identified only as Miss Scott, to the event. He believed her sister, who had been missing since 1978, might be one of the cases the artists worked on. In that case, the remains of a murdered 20 to 30-year-old African-American woman were found in a remote Tampa field in 1985. “It’s my understanding she got here today and she looked at the bust and saw some resemblances between our Jane Doe that was discovered in 1985 and her sister, and she believes that the person we discovered may be her sister,” Bullard said. Miss Scott left the presentation before talking to reporters. “It’s going to be a definitive – it’s either going to tell us whether it is or is not a family relation to each donor,” Bullard said. And giving a family that answer, according to workshop director Joe Mullins, is the hope for every case they work on. You can see video of the artists at work in the lab and making their final presentations, on University Beat on WUSF TV, at 6 p.m. Sunday, Nov. 13. In a basement classroom on the University of South Florida campus, Joe Mullins is bringing the dead back to life. The Tampa Bay History Center recently hosted a panel discussion on the now-closed Dozier School for Boys. The reform school in the Florida Panhandle has been known for decades for abuse, torture, and even murder. This week on Florida Matters (Tuesday, March 29 at 6:30 p.m. and Sunday, April 3 at 7:30 a.m.), we are bringing you highlights of the discussion moderated by Tampa attorney and History Center Trustee Bob Bolt. In April 2013, the decomposed remains of a woman were discovered behind a truck stop at I-75 and State Road 44 in Sumter County. Authorities there weren’t able to identify her, so they turned to Dr. Erin Kimmerle and the USF Forensic Anthropology Laboratory for help. 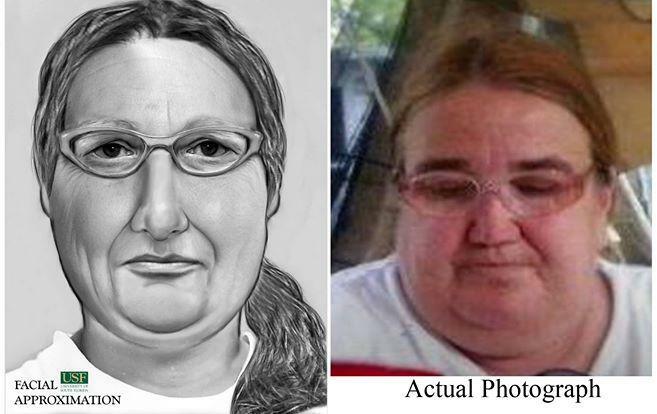 Combining a three-dimensional scan of the woman’s skull with photos from the scene and other details, Kimmerle says they were able to use Photoshop and put together a composite image of what the woman likely looked like. "The more information that we can learn from the scene or autopsy helps inform us about those individual characteristics, for example, using her own glasses in the image," Kimmerle said at a press conference earlier this year. "But it’s really just based on skeletal anatomy and we hope that it will trigger someone's memory or bring new information to light." 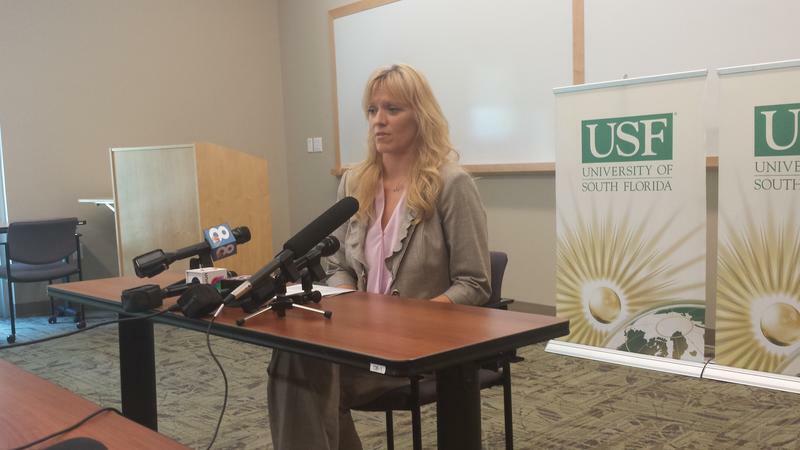 USF forensic anthropologists are getting extra money to crack cold cases. They've been awarded a $386,537 grant from the National Institute of Justice - the research wing of the U.S. Department of Justice - to examine 50 unsolved cases. WUSF's Mark Schreiner has a preview of "Deadly Secrets: The Lost Children of Dozier," which airs at 8 p.m. Friday, June 3, on LMN. The University of South Florida's lengthy investigation of the Dozier School for Boys is the subject of a national TV documentary debuting Friday night, June 3. "Deadly Secrets: The Lost Children of Dozier" takes an in-depth look at the more than 100-year history of the Florida Reform School, decades of allegations of abuse, and the mysterious deaths of dozens of students.